The insurers had condemned the old steam boiler plant and recovered temporary steam boilers were installed, to last a relatively short number of years. The additional steam mains posed large expansion problems with 10.5 bar gauge steam pressure. The 250mm main was fitted with a "3 Pin System" of hinged/angular bellows to take up a large expansion movement. Skids supports were used under the horizontally mounted 3 pin system where the movement occurred. 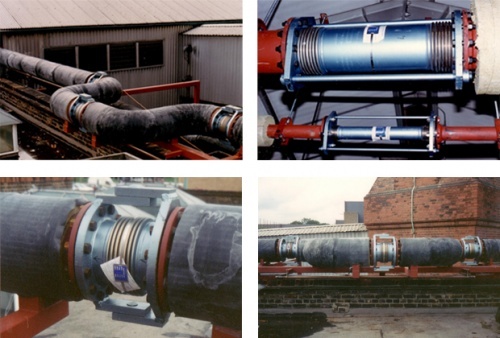 A 250mm cast steel parallel slide valve was fitted in the main run off the 400mm main steam header with articulated bellows taking up the movement and preventing stress loads onto the crown valves over the top of the boilers. Similar applied to the branches from the main condensate header returning to the hot well.